Last night was my office’s holiday dinner. There’s only five of us, so it’s always a small gathering, but it’s always always fun when we all get together, and last night was no exception. This year’s holiday dinner was at the new Crush 29 in Roseville (apparently if one is into wine, this place is a big deal; if one is not into wine, the food is pretty good, but maybe not worth driving all the way out there on a regular basis). We managed to get a little private room in the back, with a fireplace to keep things cozy. Everyone chattered and laughed all the way through dinner, and then while we were waiting for dessert, we did the gift exchange. I brought a selection of coffees and chocolates from Starbucks, with a peppermint swirled mug, and I left with a very adorable Santa ornament made from a gourd, and a little mini massager that I can see will come in quite handy the next time my neck goes completely stiff from sleeping in one position all night because of cats. Heh. This morning I woke up full of enthusiasm to get things done. Realizing this was a significant improvement on the lazy slug attitude I’ve been keeping throughout the week, I decided I might as well take advantage of it. So we got dressed and then loaded the car up with all the stuff that’s been accumulating in the front hall since we moved into this house, and after we went out for breakfast, we swung by the nearest thrift store with weekend drop-off hours, and donated the whole pile. The only things left are an old monitor that no one is ever going to want, and an ancient printer that is just as likely to remain an orphan, so we’ll have to track down a local electronics recycling center at some point, but for now, those have just been moved to the back porch, and the front hall, at least, is clear. After we got home, we pulled down all the boxes of Christmas decorations and started setting them out around the house. All five of our nativity sets now adorn the piano. The nutcrackers have been perched on the plate rack above the entrances to the living room and dining room. 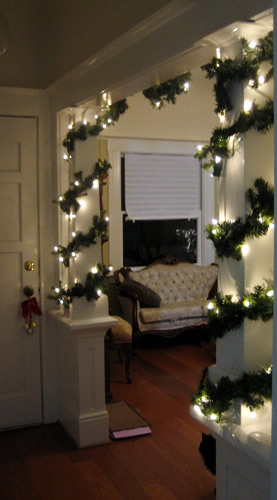 I swapped out the hand towels in the upstairs bathroom for holiday themed ones, and Richard pulled out the lighted garland and began to hang it in the living room, wrapping it first around one of the columns that grace the entrance from the front hall. However, the single strand we had that, in the old house, was plenty long enough to decorate the fireplace mantel, was definitely not long enough to decorate the moldings above both doors. So we headed off to Target to find more lighted garland, as well as to see if there was anything else that might suit our fancy for decorating. The lighted garland was easy to find, and even better, it’s exactly the same as the one we already have, so Richard was able to finish out that part of the decorating scheme, and it looks lovely. While we were there, however, we also decided to take advantage of the trip to get a few more things that have been on our list. Since the carriage house comes complete with a basketball hoop, Richard noted that we needed to buy a basketball, and there was a display of basketballs, right at the end of an aisle. I’ve been wanting a little cabinet for the upstairs bathroom because there was nowhere in that room to store things like extra guest towels and toiletries, and there was the perfect little white assemble-yourself cabinet. We needed some of those stick-up hooks to hang some decorations, but wouldn’t require nails, or damage the walls, and eventually, we found those too. We picked up a larger nutcracker for the front porch, since the front of the house still looks pretty bare. And in between all of the meandering amid holiday decorations and sporting goods and storage furniture, we ended up walking past the display of fake Christmas trees, and there we stopped and stood, pondering. I have always had real trees, and we both love having real trees. But we do not love the mess of real trees, and there is always the issue of cats. They’ve taken down the tree a few times in the past few years. Real trees can be messy, and they drop pine needles and the kind we prefer tends to give me hives if I’m touching it, and I’ve pondered the idea of a fake tree for quite some time now, but was never sure. But then we saw one at Target we both really liked. It’s got the lights already attached, so no having to worry about the cats chewing the cords, or tugging the tree down by trying to run away with the light string. The shape and the style is the type of tree we both prefer. The height is perfect for the space we’ve got, and best of all, it was on sale. We dithered. We thought about coming back another day. We debated whether or not to wait til after Christmas, or maybe til next year. And then we realized that we both really liked it, and we’ve both been pondering the exact same issue for years now, and well, why the heck not. So there we are. Now the owners of a fake tree. I’m not sure whether to be excited, or apologetic about it. We’ll see. Anyway. The tree is still in its box because we were hosting the TGIO post-Nanowrimo party and based on the size of the crowd at the kick-off party back in October, free space was going to be a premium in our living room for the evening. So instead we came home and sat on the floor of the office and assembled the cabinet for the bathroom, and then we gave the house a quick clean, and then people started to arrive for the party, and they’ve been here ever since and from the sounds of it, having a great time. The entrance to the living room, from the front hall. Azzie is peeking around the corner there in the bottom right. Notice presence of brand new cardboard cat scratching pad as well, because we are all about spoiled felines around here.